THE fact that Shamrock Rovers were able to take star man Graham Burke off the pitch with 25 minutes to go told its own story. With a three goal advantage, the points were already in the bag. 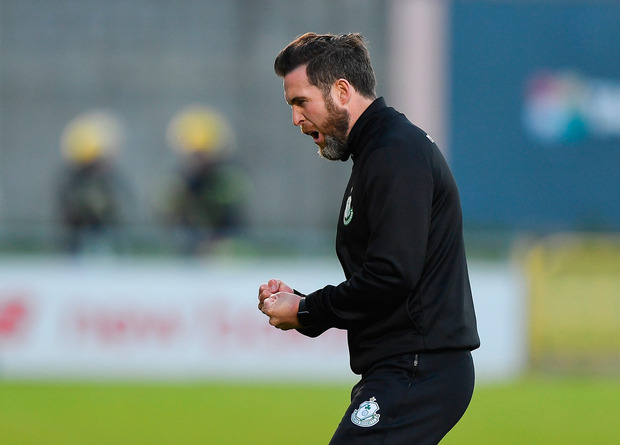 And this was just the tonic that Stephen Bradley's side needed in a week of two Dublin derbies. They came into this encounter seven points behind St Pat's after a build-up of contrasting fortunes for the southside clubs. Rovers had won just one of their previous nine league outings. Liam Buckley's Saints travelled to Tallaght off the back of four wins in-a-row. But it was Rovers that looked the superior outfit here. Granted, the root cause for Bradley's side struggles is that they have won just once on their travels, a narrow win in Limerick in March. That is just one of the reasons they will have to back this up against Bohemians in Dalymount Park on Friday. This was the ideal preparation. Bradley went with a narrow 4-2-3-1 and their strength in the centre of the park troubled the away side. Ronan Finn was pressed on to unsettle Jamie Lennon. Sam Bone and Greg Bolger stifled the threat presented by Darragh Markey and the leggy Ryan Brennan, both of whom were eventually replaced. The Saints were weakened by the unavailability of keeper Barry Murphy as his partner is expecting a baby. Canadian Tyson Farago was brought in, but the overall rearguard looked hesitant from the outset. Burke's corner was met by the head of Lee Grace for a fifteenth minute opener. The strength and skill of Dan Carr gave the Saints back four a torrid time and he spun away into space to make the second goal for Finn with a precise pass that was met with an assertive finish. That was a hammer blow for Buckley's men and it was game over before the hour mark when Sam Bone fired home a loose ball from another Burke delivery.